Your peripheral nerves communicate information between your body and your brain, carrying the signals through the spinal cord and other tissues, according to a report from Elmhurst College. Neuropathy is a type of nerve damage that can involve just one or several nerves in your body. Although certain customary and alternative treatments may help with neuropathy, there is no evidence that the drug caffeine plays a role in causing or preventing this nerve disorder. Peripheral neuropathy is a common condition that stems from various causes including direct injury to nerves, prolonged exposure to cold temperatures, prolonged pressure on the nerves and hereditary factors. It can also be caused by systemic diseases such as kidney disease, cancer, vascular disease, lyme disease, shingles, hormonal imbalances and even environmental toxins, according to the National Institute of Neurologic Disorders and Stroke. Symptoms of this nerve disorder include tingling, pain and numbness, as well as an inability to determine the position of your joints, which means you are not able to accurately coordinate movements such as reaching or tying your shoes. Many types of neuropathies start with changes in the sensations of your feet, gradually progressing to the middle of your body. Damage to your autonomic nerves can lead to diarrhea, difficulty urinating, heat intolerance, vomiting and unintentional weight loss. Standard and customary treatments for neuropathy include physical therapy and medications for pain, as well as identifying and treating the underlying cause of this disorder, such as diabetes. According to American Family Physician, certain alternative remedies provide some benefits in the treatment of peripheral neuropathy. These treatments include acupuncture, l-carnitine and alpha-lipoic acid. There is no indication that caffeine works as a medicinal or natural remedy for this disorder. Although caffeine may not help with neuropathy, this common ingredient can have an effect on your central nervous system. Caffeine is a stimulant that can help enhance mental alertness and reduce feelings of fatigue and drowsiness. Drinking more than two cups of regular coffee per day, however, can cause tremors, irritability, headache and nervousness. Caffeine can be addicting and withdrawal symptoms may include the same symptoms you may experience when consuming too much of this stimulant. Avoid using unproven remedies to treat medical conditions, such as neuropathy. 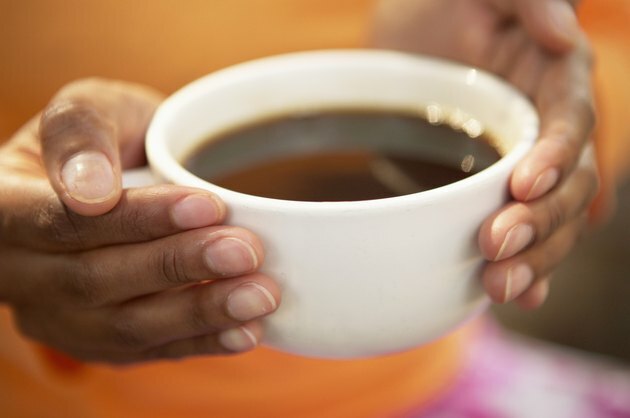 Although there is no evidence that caffeine affects your risk factor for developing neuropathy, this substance can cause uncomfortable side effects and is unlikely to treat the symptoms of nerve disorders. Always talk to your doctor before you begin using an alternative treatment for any serious medical condition, including neuropathy.